WebFocus Solutions Review 2019: Is WebFocus Solutions a Good Hosting? 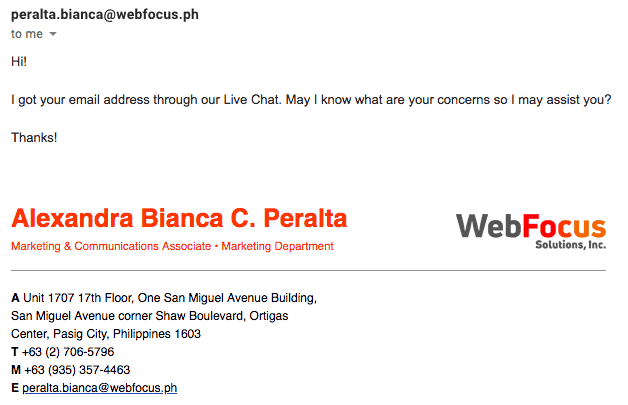 WebFocus Solutions, Inc. is a long standing Filipino company with a strong social media following. The features may be higher than advertised, however, it was hard to get support from customer service. 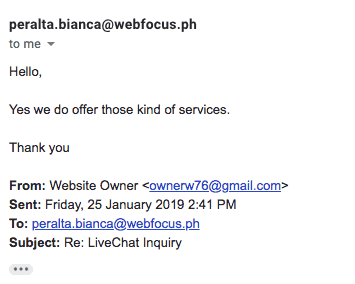 WebFocus Solutions, Inc. (WebFocus) is a Filipino business selling hosting as well as a range of other internet services. It has been in business since 2001, with more than 1,200 customers from around the world and an active Facebook page with approximately 10,000 followers. The website and support are provided in English. There are three shared hosting plans: Standard, Deluxe, and Corporate. Unfortunately, although the resource allocations are high enough (up to 9GB disk space and 135GB bandwidth), but with only one domain allowed, there’s nothing “deluxe” or “corporate” about the plans. Furthermore, this company commits to a 99.5% uptime with no SLA, and it’s also well below the industry average, of 99.9%. As the package detail pages on the website are very empty, I tried to get some more information from support to confirm the inclusion of certain value added features (e.g., Microsoft SQL databases, remote MySQL connections, SSH access, Cron jobs, a software auto-installer, and website builder). Despite several contact attempts, I was advised “Yes we do offer those kind of services”, which is a little vague, so I can’t comment which items on that list are included, or not. I can confirm that there’s support for PHP, phpMyAdmin, and MySQL databases, as well as auto-enabled sFTP and a free Let’s Encrypt SSL certificates for all hosting plans. Plus, when you’re ready to scale your online business, it does sell a range of enterprise level services such as managed hosting and bare metal dedicated servers. The prices include VAT and a free Let’s Encrypt SSL certificate (domains are available for purchase), however, the packages are expensive given the level of resources and advertised features. Granted, the plans may include far more value adds than advertised on the website, which could go part of the way to justifying the high price. Plans are available in yearly terms only and although the prices are displayed, you cannot purchase the packages online. Instead, you need to inquire via the contact page and a member of the team will contact you to begin the setup process. On paper, customer support looks excellent. There is 24/7 technical support and you can contact the team by email to various departments or via phone, ticket, or live chat. There’s also a small blog on the website, and a pretty substantial knowledge base with help documents and tutorials. Unfortunately, my experience with customer service was not positive. Over the course of five business days, I contacted them several times by live chat and email, sometimes not receiving any reply, while other times receiving a one sentence response, which didn’t answer my question, meaning I needed to chase them up again (and wait again). I’ve also been left waiting on live chat while it was online. According to the website, this is the “fastest, most reliable and scalable web hosting solutions in the Philippines”, however, like the website, this statement is quite vague, and sadly, I couldn’t find any data to back it up. The customer service was slow, the prices are high, and the resources are low. There may be more features included, however, I couldn’t say, as live chat didn’t give me a definitive answer. Wondering how WebFocus Solutions stacks up against other Web Hosting companies? Enter any other Web Hosting company and we will give you a side-by-side comparison.